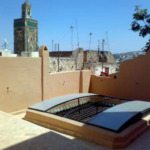 Since 2007, the team at Fez Real Estate has renovated more than a 10 riads intended for both private use or transformed into guest houses and commercial space. 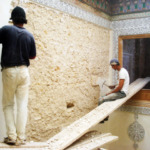 Through these projects, we have gained an exceptional knowledge of the architecture and structure of the traditional houses of Fes, as well as the restoration techniques suitable for the medina of Fes. We have also acquired a command of the prices for the various trades, materials, techniques in practice, transport, etc. 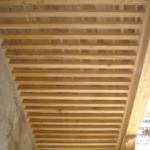 For each project, we define with you the specifications to convert the house according to your criteria. We request estimates and select among them in order to present you with what seems to us the best value for your money to complete your project and not simply the lowest-priced estimate. We establish with you a timeline for completion as well as a provisional budget with the greatest possible detail. 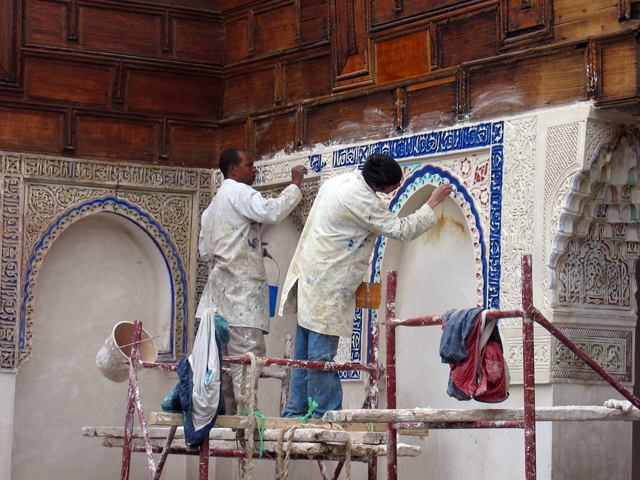 We put in place the teams of craftsmen along with the order in which they begin their work. 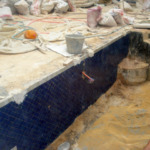 Finally, we supervise the work site everyday allowing us to identify in advance any problems that might arise and communicate with you throughout by telephone and email with our observations and accompanying photos. Communication with the client is an essential point for us. We insist on providing you the information you need to understand what is going on with your project and how it is advancing. We bill our monthly fees according to a schedule determined with you that takes into account the complexity of the work at the time and the time we dedicate to your site as a result. 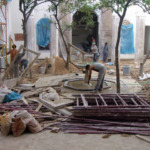 At Fez Real Estate we are never compensated by the craftsmen nor do we ever receive a commission from the vendors, allowing us to be entirely objective and guarantee you our integrity in overseeing your project. Palace from the XVII century, about 1000 m2 with all the original details intact (doors, mosaics, painted wood ceiling, plaster carvings…). 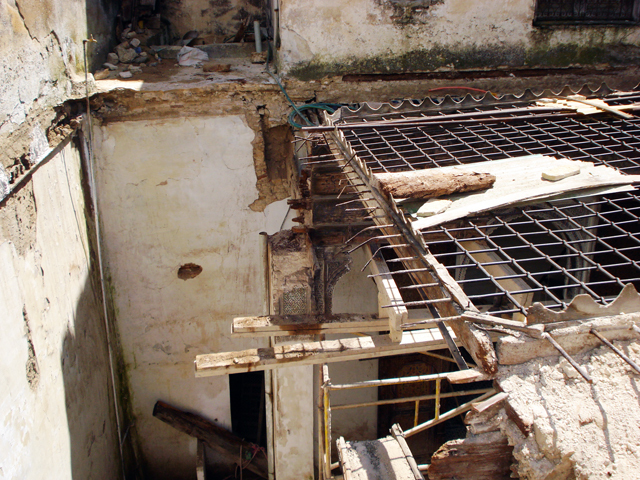 Works undertaken : The riad was already majestic but completely dilapidated with a few structural problems. 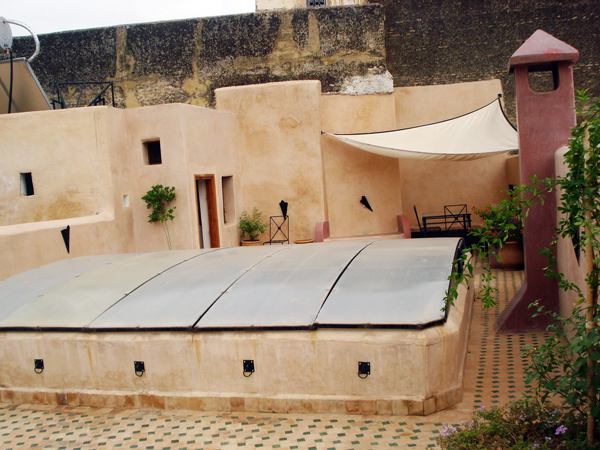 It had everything to create a guest house of 8 rooms. 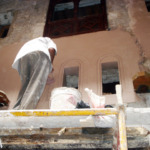 Restoration work took 15 months with between 30 and 50 people on site everyday. 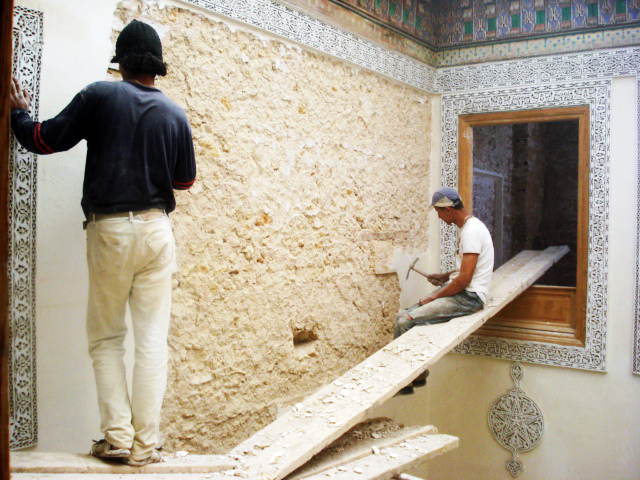 • Stripping the walls, repairing damaged ones, reorganization of the rooms. 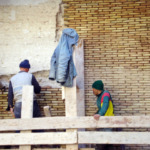 • Creating bedrooms, bathrooms, common spaces, fireplaces and kitchens. • Completely rebuild the terrace. • Landscaping the garden courtyard. • Full plumbing and electricity. 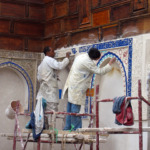 Plaster and paint. 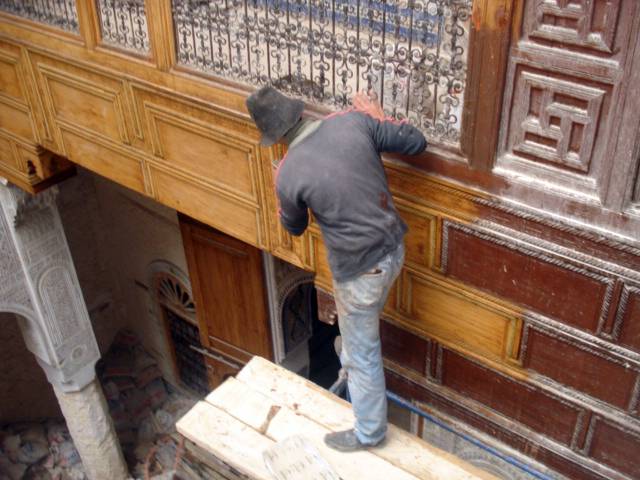 • Restoration of all original architectural elements (wood, doors, windows, plaster, tiles and mosaics). 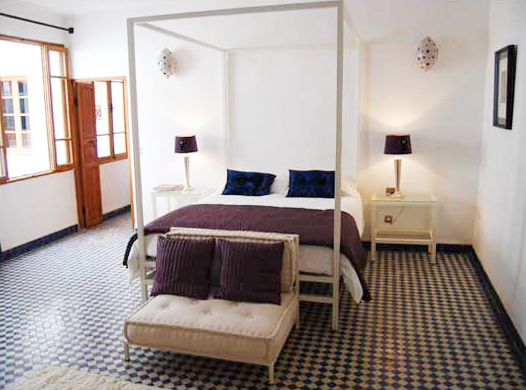 With a surface area of 250 m2, this 250-year old house is situated in one of the oldest neighborhoods of the medina. Four columns about 12m high support a magnificent first-floor balcony looking out over the interior courtyard. 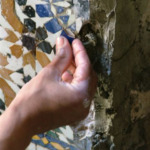 The marble and mosaic floor required restoration. 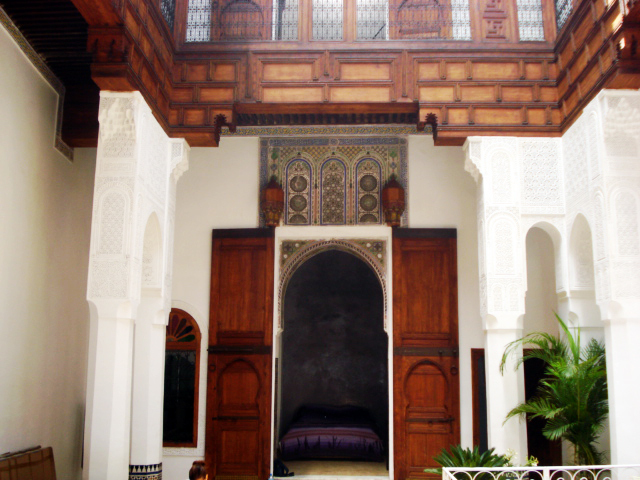 The beauty of this house is also due to its immense cedar doors and sculpted plaster that had suffered heavy damage. 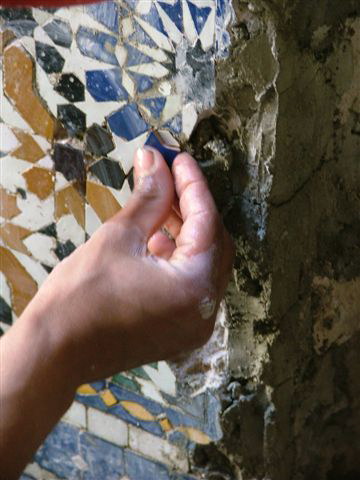 • The first step was to strip the old plaster to allow us to see that a wall about 12m high and 5m wide had significant vertical cracks due to water leakage from the terrace (identified from the first visit). 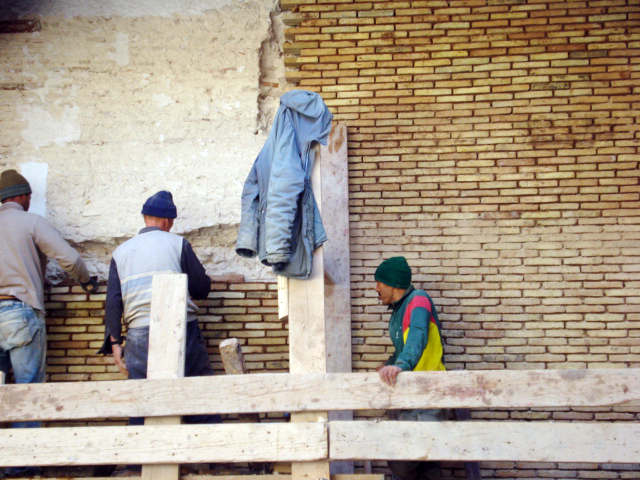 It was critical to consolidate this wall with traditional brick and wooden braces. 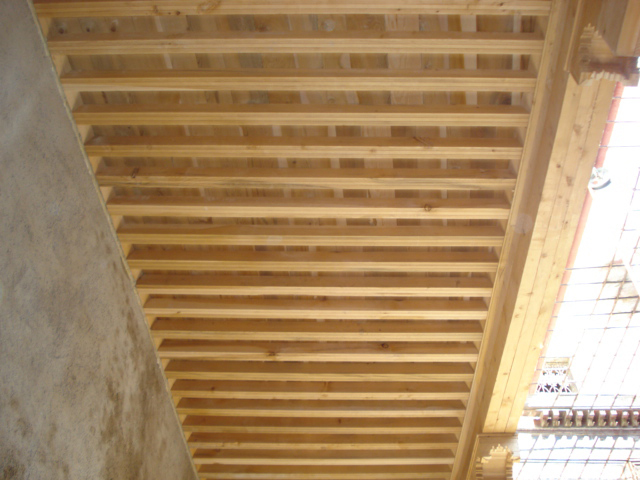 • Once this step was completed, the wood ceilings situated under the terrace were entirely replaced which allowed us to seal the terrace. • After finishing major works, the reorganization of the house began. At the owner’s request, we created four bedrooms with bathrooms and two living rooms with fireplace. 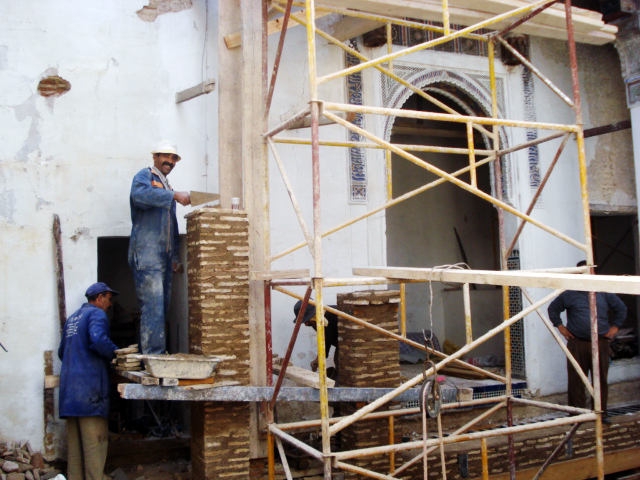 • Major work to refurbish the wood, sculpted plaster, and zellige returning the house to its original splendor. • Work was completed in 18 months. This house is for private use and rental. 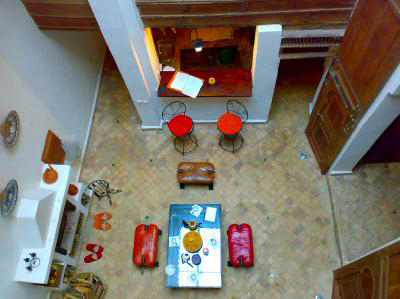 A house of about 180m2, with the particularity of a very old section with a well lit courtyard and more recent addition of the second floor. 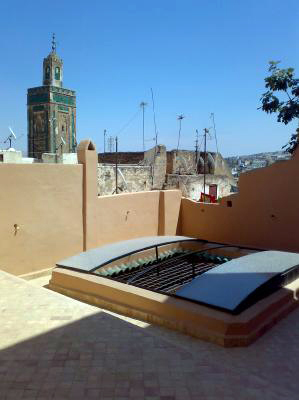 The terrace offers an exceptional view over the medina. This house lacked traditional elements such as sculpted plaster and antique wood but had enormous potential. 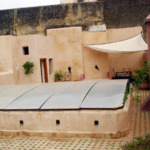 • Water tightness of the terrace, which is critically important for these small palaces. 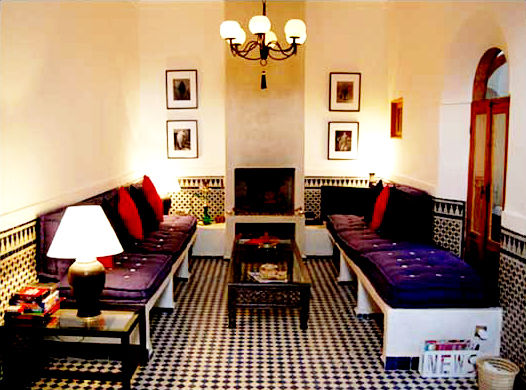 • Creation of three large bedrooms with full bathrooms in tadelakt (traditional lime plaster) and a very handsome living room with fireplace. 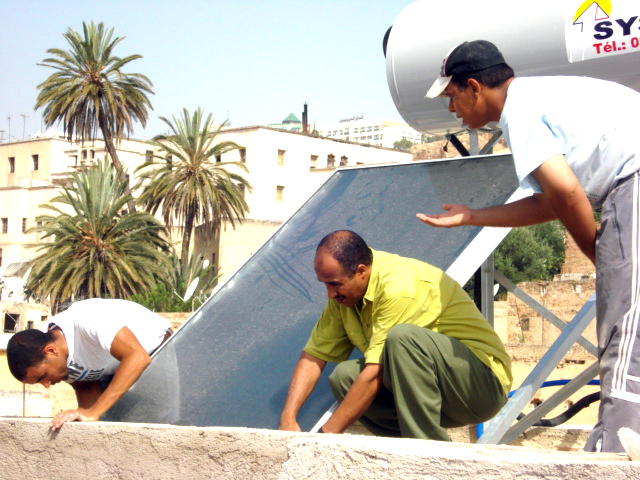 • Plumbing and electricity were entirely redone; we installed a solar panel to supply the house with hot water. A little Andalousian palace of about 240m2 with a majestic courtyard of 80m2 surrounded by 8 columns in sculpted plaster supporting a balcony that leads to 3 suites on the second floor. 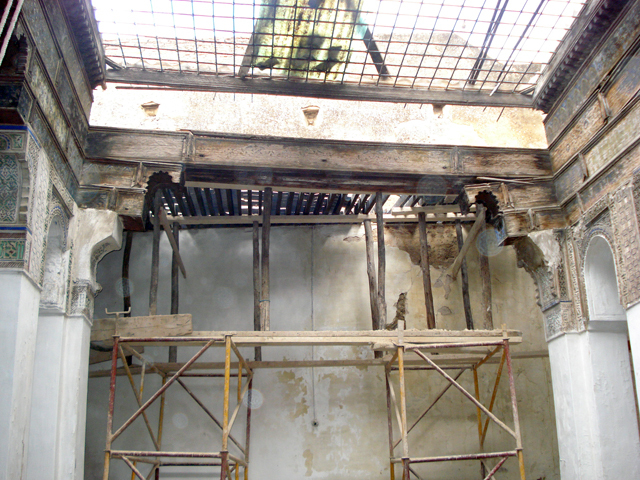 The wood and sculpted plaster in this palace did not suffer much wear over time. 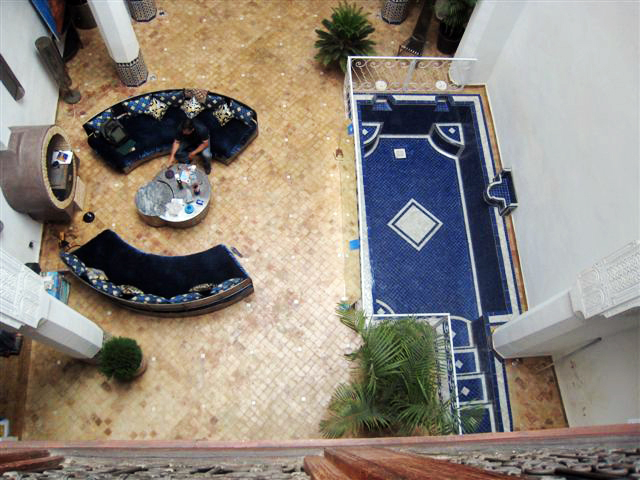 Located at the bottom of the medina, near to Place Rcif, the riad has an exceptional view from the terrace of the entire medina. 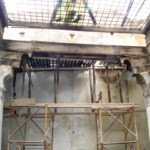 • The restoration, which took 18 months, was largely an effort to strip the existing wood and restore the tile floors. • At the owner’s request, we created four bedrooms with fireplace and bathroom as well as a heated pool (5 x 2.5m) in the courtyard. 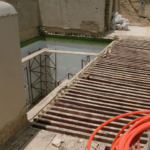 • Electricity and plumbing including drainage were entirely redone. • We also entirely redid water tightness of the terrace in addition to a tadelakt finish and a significant amount of wrought iron for the staircases and overall décor. 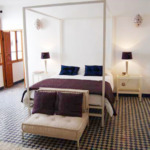 This riad is for private use and rental. 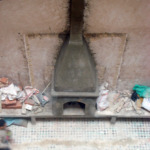 A typically traditional house of about 170m2 located in a quiet neighborhood in the heart of the medina near Bab Guissa. 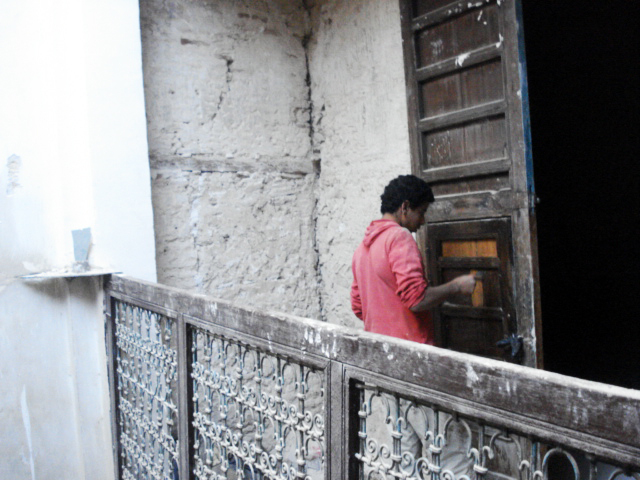 The narrowness of the alleys to reach this house required us to use donkeys to remove the rubble. • This house did not require major structural work, however early on we noticed a problem with the sewage system beneath the patio. 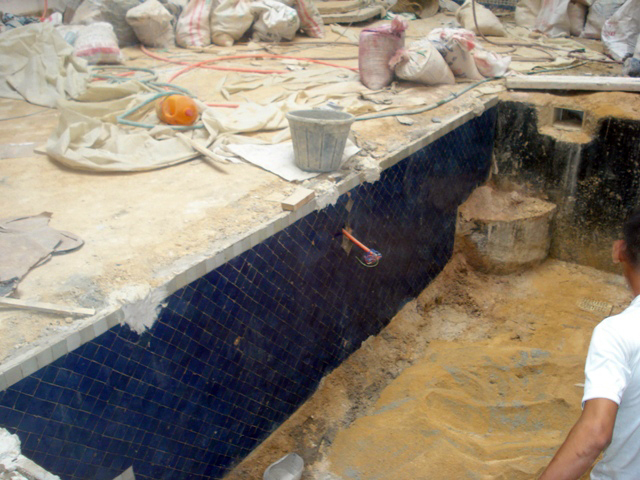 We dug down 60cm beneath the patio in order to redo all the pipes for the neighboring houses (in PVC of 40cm). 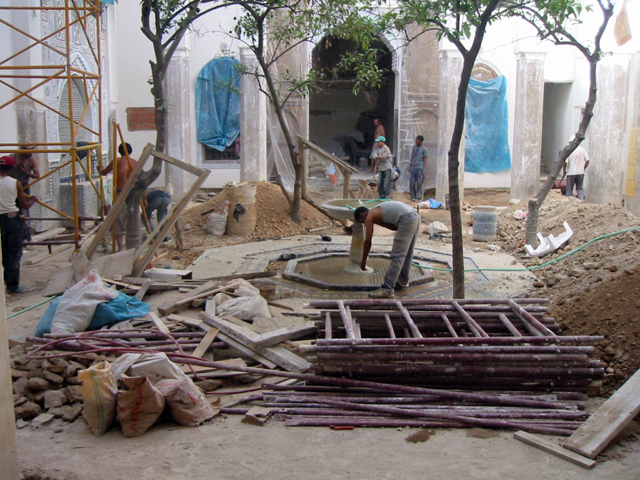 • Once we made this repair, we filled the ground of the patio with volcanic rocks to allow the earth to breath and covered it all with a concrete screed on which we could pose the floor of bejmat (terra cotta tiles). 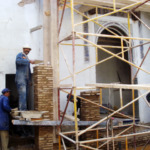 • Then the arrangement of the house was simple, the owner asked us to create three bedrooms with bathrooms in tadelakt and exposed traditional bricks. We also built a magnificent fireplace in the courtyard. • Work was completed in 8 months. Andalousian architecture. A patio of 100m2 allows natural light to enter throughout the day. 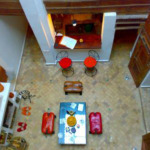 In addition, the house is located in the heights of the Ziat neighborhood with an exceptional view from the terrace. 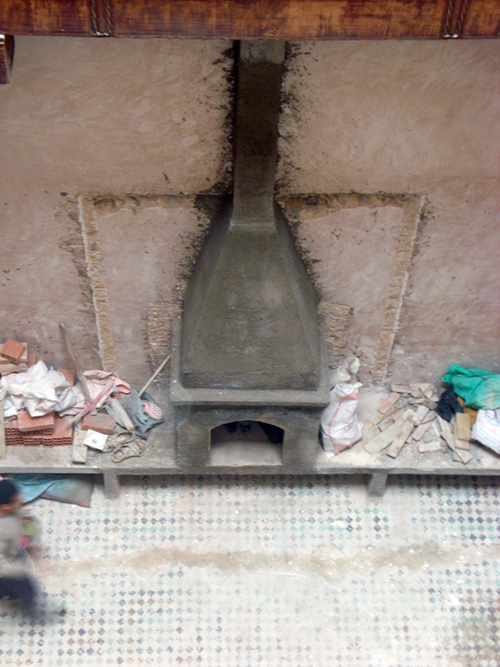 Note: Since 2009, a minimum of 5 bedrooms with bath are required in order to create a guest house in the medina of Fes. 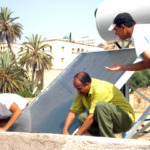 • The structure of the house facilitated the work. The greatest concern was to create 5 bedrooms with bath, requiring us to take down several walls and build others as well as create openings for doors and windows. 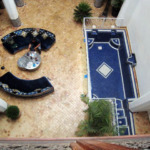 • The most important request for the owners was to build a jacuzzi in two places on the terrace. 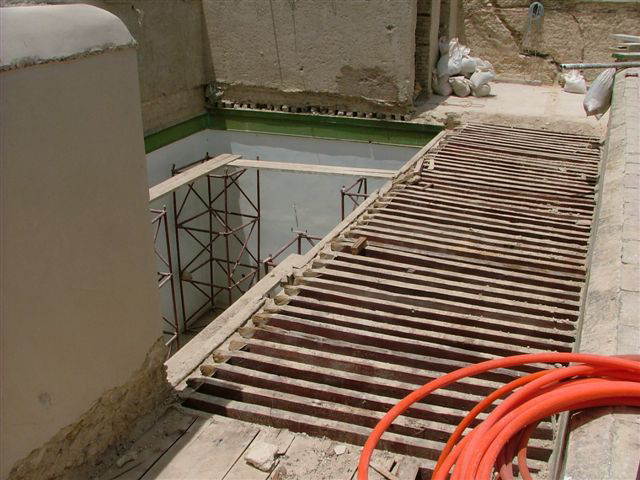 For that we reinforced the terrace with a grill of 10cm iron bars that could support the weight of 500 liters of water heated by a solar panel. 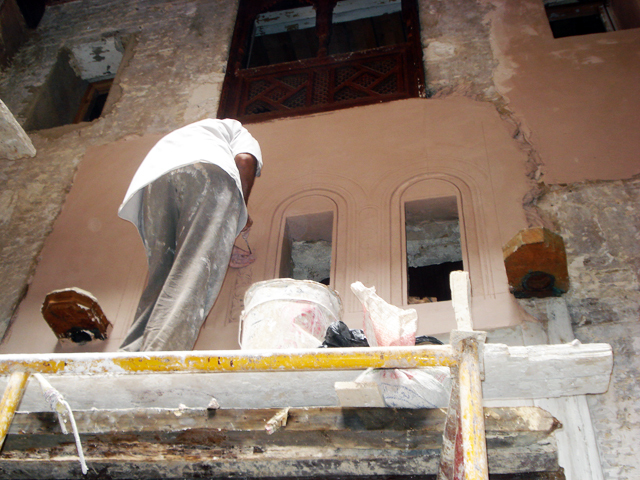 • The owners are completing the decor so that they can open the doors of their guesthouse within the next few months. 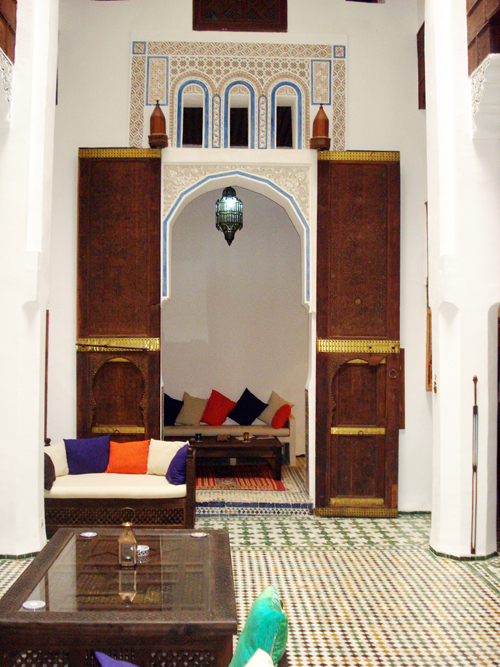 Traditional architecture of Fes, sculpted plaster on the columns and above the 4m tall doors, a magnificent balcony in moucharabieh overlooking the courtyard tiled with marble and small zellige. 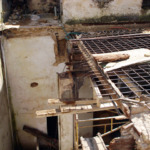 • This house had significant structural problems, so the first step was to shore up half of the house with hydraulic jacks in order to take down the terrace and replace the bearing beams, a process that took about two months. • Once completed, we were able to begin the standard work to re-organize the house to accommodate four bedrooms with bathrooms, two living rooms and a kitchen. This house is for private use.